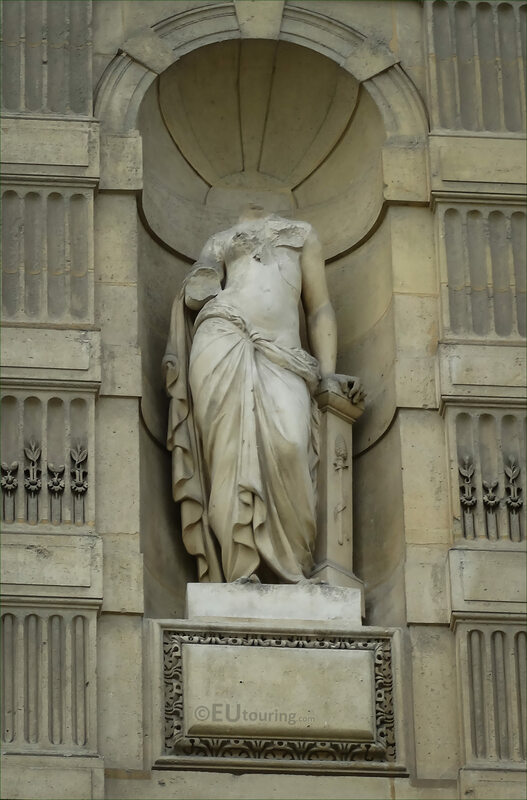 We were in the 1st Arrondissement of Paris at the famous Musee du Louvre, when we took these high definition photos showing the statue of Erigone, which was sculpted by Pierre Alexandre Schoenewerk. This first HD photo shows the statue of Erigone located in a niche on the second level of the Aile de Flore, which is a wing on the former Palais du Louvre, and when you are within the courtyard called the Cour du Carrousel, this statue can be seen second from the right hand side. 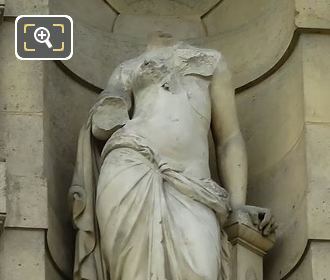 Now as you can tell, unfortunately the head of this statue is missing, yet it was originally designed to depict Erigone, who was the daughter of Icarius in Greek mythology. And according to the myth, Icarius had given shepherds wine, but some thought he had poisoned them and killed him. Yet when Erigone found the grave of her father under a tree, she hung herself from one of the branches. So this particular statue was produced by Pierre Alexandre Schoenewerk who was born in Paris in 1820 and being the son of a French sculptor he followed in his fathers footsteps, but also studied under David d'Angers, first presenting at the 1841 Salon. 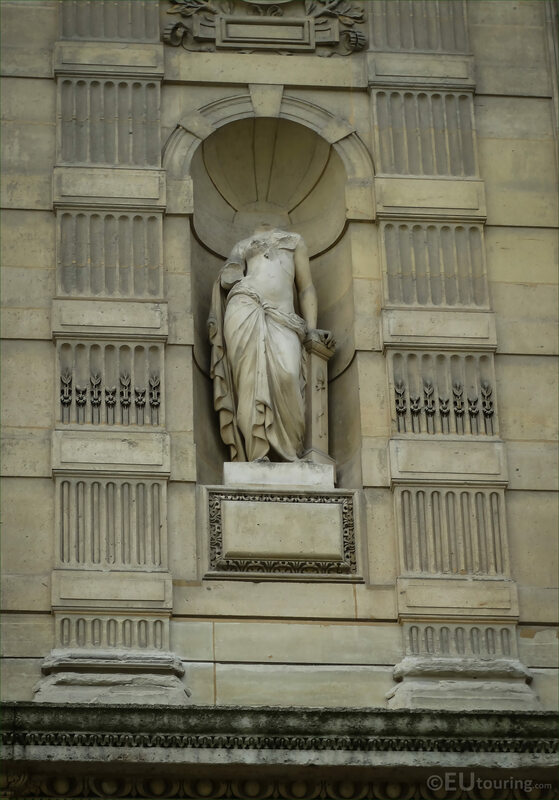 Pierre Alexandre Schoenewerk received numerous different commissions for statues and decorative works including this one of Erigone and several others for the Palais du Louvre, but also for other tourist attractions in Paris such as the Musee d'Orsay. Yet unfortunately, his life was not always a happy one, with his first wife passing away, and then his second wife going insane, and overwhelmed by his wife's illness plus one of his works not being appreciated, he committed suicide in 1885.